A famous, award-winning chain of breakfast and lunch eateries has made its way to our Carrollwood Community. The 242-seat Broken Yolk Cafe – boasting a huge selection of breakfast and lunch items, opened its doors in April 2016. Known for its generous portions and upbeat casual environment, Broken Yolk has never been more popular than it is today. As its fan base has grown well outside of its original San Diego home, into the heart of our neighborhood. “Finally, a good Breakfast In Carrollwood” says Katie from Tampa Bay, about her recent visit to the Broken Yolk. “The place is absolutely amazing; it offers a unique menu that is not massed produced like other breakfast restaurants. Offering a traditional breakfast fare, many dishes with a Mexican twist, as well as lunch options… My only complaint is that they close at 3:00pm!” Katie adds. And Katie’s feelings are shared amongst many! The Broken Yolk Cafe has hundreds of great reviews from satisfied customers, who have already visited this new neighborhood gem. Offering traditional breakfast and lunch staples, as well as one-of-a-kind signature dishes, Broken Yolk has been a San Diego County native’s favorite place for over three decades. Founder John Gelastopoulos, a Greece native, arrived to this country with only $20 in his pocket, making his success story, the true definition of the American Dream. John made his way to San Diego, where after a lot of hard work, he managed to purchase the Broken Yolk back in 1979. Since that time, the cafe has expanded to 17 franchises throughout the United States. Twenty-three additional locations are in development. Currently, 16 of these stores are in California. There is only one store in Florida, and lucky for us, it happens to be right at the Carrollwood Shopping center, located at 10442 Dale Mabry Highway, because, per a company spokesperson, people polled in the area enjoy hearty breakfast options. I happen to agree! 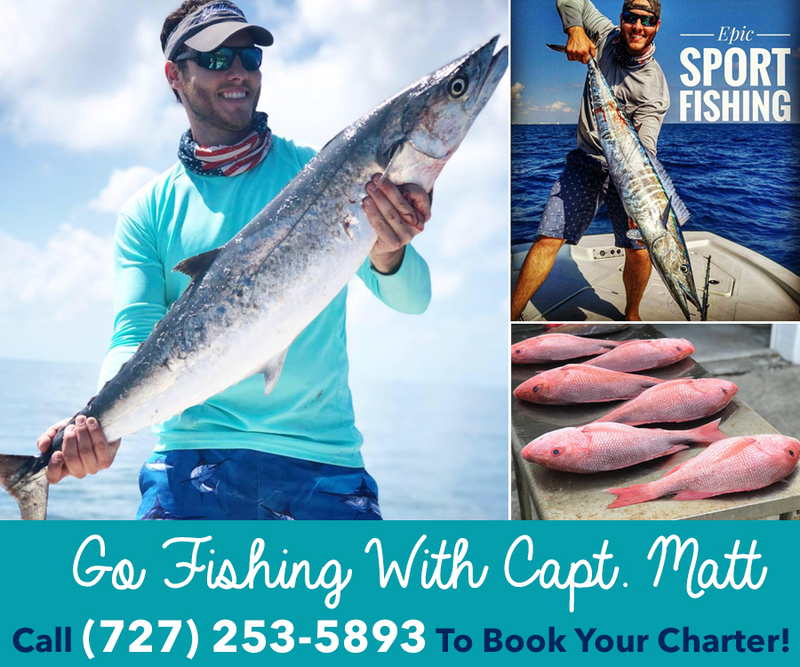 Managing partner, Ray Pontinen, told me that he and his partners have the rights to build 13 more locations, here on the West Coast of Florida! They are looking forward to growing and expanding, and to become part of the South Tampa, Brandon and St. Pete community. Ray and his partners selected Tampa Bay because of the incredible growth opportunities and of course, the warm weather. So what sets the Broken Yolk apart from the competition? Where to start!? Their extensive menu offers over 90 items! Including delicious lunch options. The cafe can also accommodate guests’ gluten-free meal restrictions. What makes the menu truly unique and special is the South of the border section, which is unmatched here in Tampa Bay. 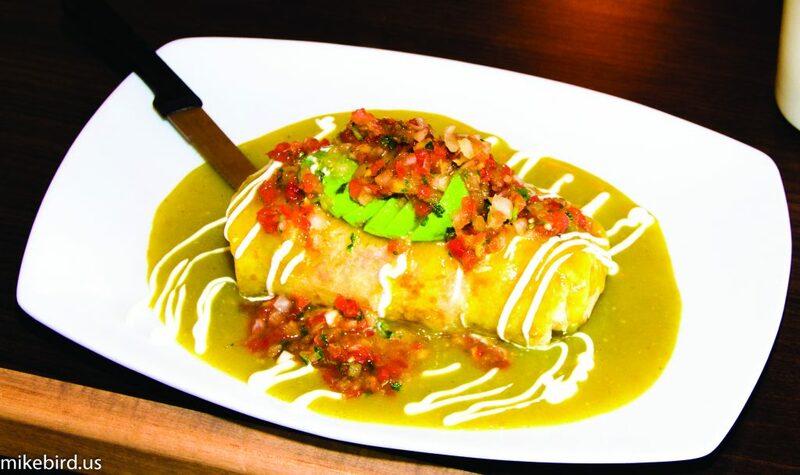 It features classic Mexican options and Southwestern favorites, which can be really hard to find in the area. 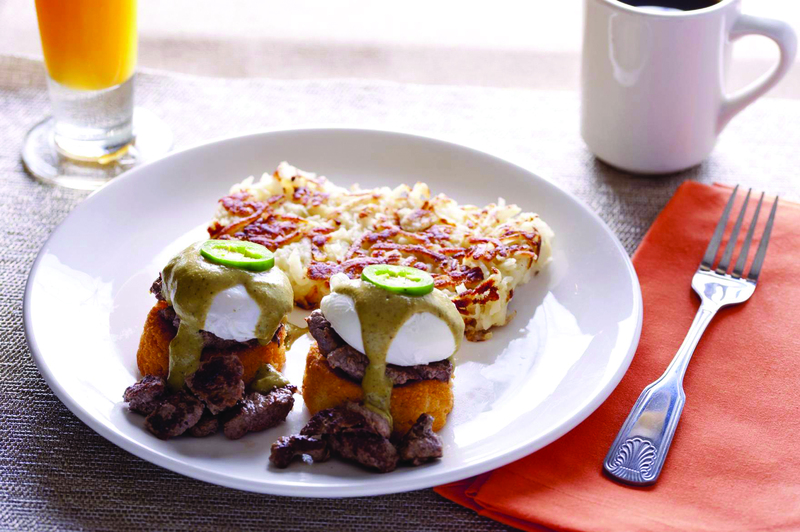 For example, they serve traditional “Huevos Rancheros”, “Machaca” and “Chilaquiles”, to name a few. Traditional Machaca is marinated beef or pork that is rubbed with spices, pounded, dried, and shredded similar to beef jerky. Machaca is commonly used in the popular local cuisine of Northern Mexico and Southwestern United States. Chilaquiles are also a traditional Mexican dish, consisting of fried corn tortilla strips, typically topped with a spicy tomato sauce and lots of cheese. No… these are nothing like Nachos! You have to come try them and see, and TASTE for yourself! The Broken Yolk features 13 types of omelets, 6 types of eggs Benedict, fluffy waffles, sweet potato pancakes, crepes, wraps, specialty hamburgers and several salad options. They also offer health conscious items like the “Wellness Wrap” which is made with a spinach tortilla filled with egg whites, fresh spinach, roasted bell peppers and feta cheese served with a side of fresh fruit. At the Broken Yolk there are plenty of scrumptious options to choose from, and with these many wonderful choices, you’re going to want to visit every chance you get to try them all! I know I will, I have already visited a few times! “We are known for a broad menu and have folks visit our restaurants three and four times a week,” said Valerie McCartney. “Our extensive menu helps eliminate menu burnout or menu boredom” she added. A community favorite, and a typical Californian dish at the Broken Yolk, is the “Tiki Toast.” Which consists of two extra thick slices of sweet Hawaiian bread, dipped in egg batter, then griddled to a golden brown and topped with strawberries, blueberries, caramel drizzle and shredded coconut. YUM! Other California favorites include the “Southwestern Wrap”, the “Chipotle Chicken Sandwich” and the “California Chicken Club Sandwich”, all prepared with a west coast flair. Everything is made fresh daily, and most items are completely made from scratch, and you can definitely taste the difference after each bite. On another occasion (I told you I was coming back for more!) I ordered the “Border Benedict”, a wonderful spin on the classic Eggs Benedict. 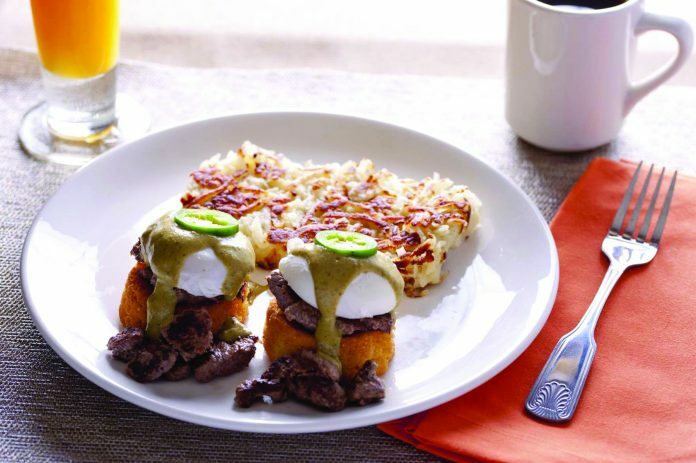 In this case, going “South of the Border” means two poached eggs and seasoned carne asada, atop two sweet corn cakes, smothered in their homemade poblano sauce. I got a side of home fries with mine, but you can also choose hash browns, mexican rice, refried beans or fresh fruit. The first thing I noticed was how outstanding the poblano sauce was. The carne asada was delicious, perfectly seasoned and not fatty or greasy. The combination of sweet corn cakes and hot peppers placed on top gave this dish a whole new dimension of flavor. Each bite was spicy, sweet and very savory. This is a must try for Benedict lovers, who like their eggs with a kick! And if all of that wasn’t enough, the drink list at the Broken Yolk is also unbelievable! Any Mimosa fans out there? They offer not just the traditional mimosa, made with orange juice and champagne, but some of their specialty drinks include the “Hibiscus Mimosa” and “Pomegranate Mimosa”! How about smoothie fans? Then I suggest you try their strawberry and banana smoothie or the blueberry smoothie. The back of the restaurant is available for private meetings upon request. They are open 7am to 3pm 365 days a year and is located at 10442 N Dale Mabry just north of Linebaugh on the west side of the street. They can be reached at (813) 769-9358. Visit the Broken Yolk today for a delicious breakfast or lunch you won’t soon forget!